As most Mamas know, there has been a battle raging for quite some time over whether or not vaccinations can cause or trigger Autism in small children. I'm not planning on picking a side here, or stirring the debate further. I simply wanted to draw attention to this article in Saturday's New York Times, by Gardiner Harris, that highlights some new information. Harris begins with two disturbing cases of children who, shortly after receiving vaccines, showed rapid decline in motor skills, appetite and strength. One child was ultimately diagnosed with Autism, the other child died. Apparently, both of these children had mitochondrial disorders, which are genetic diseases and, according to Harris, "have received almost no attention from federal health officials." Not much is known about mitochondrial disorders--or Autism, for that matter--and at this point no one is willing to draw a definitive link between the two. As Harris points out, multiple studies have been done to try to show some causal relationship between vaccines and Autism, all of which failed to do so. Many parents of Autistic children, however, believe unequivocally that vaccinations caused their children's illnesses. Perhaps further research on mitochondrial disorders will prove to be the missing link. At present, there is no definitive test for mitochondrial disorders, which might help identify children at risk for having a devastating reaction to a vaccine. Federal health officials aren't even willing to determine yet that the mitochondrial disorders had anything to do with the terrible consequences for the two children in the article. So while little is known, it is important enough for parents to stay on top of. For more information on mitochondrial diseases, visit the United Mitochondrial Disease Foundation. For information on Autism, visit Autism Speaks or the Autism Society of America. You've got the sparklers on standby and the grill is clean and ready to go. So, any idea what you'll be cooking for your July 4th festivities this weekend? The Food Network has several refreshing ideas that go way beyond The Burger. Like this one for Skirt Steak Fajitas and Roasted Tomatillo Salsa. Pair them with the Honest-to-Goodness Margarita from The Splendid Table and you'll have a Fiesta Fourth for sure! Or maybe you're up here in the Northeast and crave the Vineyard-style celebration. You could try the traditional classic New England Lobster Dinner. Take it up a notch with your homemade Crab Cakes with Brown-Butter Tomato Vinaigrette and pair the whole thing with an unexpected, deliciously crisp Albarino, and your guests will simply swoon. But maybe you just want burgers with a twist, like these Barbecue Buffalo Burgers with Mango Ketchup. Mix up some Sangria for the occasion and your guests will be toasting your innovation. A couple of days ago, the Tara Parker-Pope of the New York Times highlighted an article presented by PsychCentral, about Fatherhood in America. The PsychCentral article, by Marie Hartwell-Walker, Ed.D., touches on the confused view American Pop Culture has of Fatherhood (see The Simpsons, Everybody Loves Raymond, Two and a Half Men, or even the late 20th Century classic, Married With Children, etc. ), which presents itself in fits and spurts of half-hearted, ill-fated attempts by Fathers to do something right in their homes or families, but generally disappointing all involved. Hartwell-Walker decides to leave it to "the sociologists to explain the many and complicated variables...that are at the root of...the pejorative TV scripts," and chooses, instead, to focus on what kids actually need from their fathers, and how fathers can give these things to their children, whatever the state of the family. She touches on some big paternal issues like "embracing the responsibility" of fatherhood and the importance of present and consistent fathering. These seemingly elemental points are applicable both to the "father-absent" homes, as well as the homes in which the father resides. Often, a father lives at home, but is physically or emotionally absent much of the time due to work and other of life's stresses. This kind of absence can create a host of problems all its own. She also suggests striking a balance between discipline and fun, another important piece of advice. Often, I think, dads get caught in the "Wait until your father gets home!" cycle, which does neither dad nor kid any favors. But perhaps my favorite point Hartwell-Walker makes is for fathers to "be a role model of adult manhood." This is equally important for girls as it is for boys, as Hartwell-Walker points out. She tells dads, "Make no mistake: The kids are observing you every minute. They are taking in how you treat others, how you manage stress and frustrations, how you fulfill your obligations and whether or not you carry yourself with dignity." Indeed, she notes, that boys will grow up like their fathers, and girls will choose men as partners who strongly resemble their fathers, emotionally speaking. Much is made, perhaps especially in the blogosphere, of Motherhood and the role of Mom, here at Mama's Cup as much as anywhere else. And of course--do I even need to write this?--nothing replaces a mother's nurturing and love. But when you examine Hartwell-Walker's conclusion--that it doesn't matter what a father does for a living or how much money he makes or what his hobbies are, what matters is a father's long-term commitment and involvement--it becomes clear that nothing replaces a father's guidance and love either. I mentioned recently that we are in party planning mode around our house because the little one is turning two. I had the ambitious idea that we would make our own invitations, employing the help of the birthday girl. And while the experience provided many giggles, the result has been something less than I had envisioned. 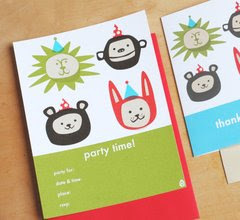 Maybe I should have just bought some sweet invitations like these from Little Circus. My Wish-I-Had-Time-To-Read-This list is growing faster than ever. I can't wait to get my hands on this one by Nancy Carlsson-Paige. 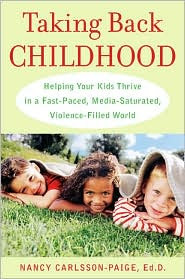 It's called "Taking Back Childhood: Helping Your Kids Thrive in a Fast-Paced, Media-Saturated, Violence-Filled World." This book is right in line with another on my list and, at first glance, seems to reinforce my views on child rearing in the 21st Century. It requires a concerted effort to allow children mental space for open, imaginative play, now more than ever. It takes focus just to find toys that aren't pre-scripted and ready to drive off and play with themselves. Carlsson-Paige advocates clay and paint and blocks over the recognizable Disney characters, who by their very nature, come with a pre-determined storyline. "Perhaps because of the belief that a video can raise their babies' IQ, or can at least be 'educational,' more than a quarter of American children under the age of two have a television in their room, in spite of an appeal by the American Academy of Pediatrics that children under two not watch television at all. On a typical day, 61 percent of children six months to twenty-three months watch television; by age three, 88 percent do. The median time that children from zero to three spend watching some form of media on the screen is slightly under two hours--about as much time as they spend playing outside and about three times as much time as they spend being read to." When did we, as parents, decide to outsource the raising of our children--the shaping of their minds, values and sense of self--to Hollywood? Allowing corporate media and marketing giants that kind of unfettered access to our children's developing minds will, without a doubt, have consequences that run much deeper than I think we can imagine. The longer we can let our children be children, the longer we can keep them out of the marketers' reach, the more space we can give their minds--and souls--to grow and experiment and flourish, the better off they will be. For small children, every experience is a "learning" experience. A six-month-old doesn't need an educational toy; every experience a six-month-old has is educational. I believe we need to let ourselves--and our children--off the hook. We need to let our kids be kids, without organizing the fun out of their days. This, I truly believe, is the best way for children to grow intellectually and emotionally. Do you dream of your kids eating healthy, delicious meals that you have thoughtfully and lovingly prepared for them, without screaming, crying or anything being thrown on the floor? Well, I'm not sure this will help with the applesauce that's currently fossilizing on your kitchen floor, but it might give you some fresh, new ideas. It's a website called Smart Foods Healthy Kids (via teensygreen). SFHK offers everything from recipes (like this one for "Pizza in a Bowl") to allergies to "breastfeeding 101." They employ multiple resources, including their resident online pediatrician, Dr. Natalie. SFHK even offers quick tips and articles on how to make your home little bit healthier. And it is all done with a good dose of humor, so it doesn't intimidate. As rare as it is lovely, this book is quite a treasure. If you manage to find one, I'd recommend keeping the sippy cups and sticky fingers at arm's length. NPR aired a difficult story this morning, about Section 60 Mothers. Section 60 is the area of Arlington National Cemetery reserved for the new graves for the soldiers who die in Iraq and Afghanistan. These mothers have formed a new family of sorts, through their shared experience of loss and grief. Listen to the audio on this one, listen to these mother's share a bit of their stories. It is sad, yes, but powerful. And necessary. People need to listen to these women and to remember their children. Here is another moving story from the Story Corps project that I heard on NPR this morning. This one is from a man who remembers his time as a child in an orphanage and the time when he finally went home. If you're able, listen to the audio on this one. According to CNN, Americans drove 1.4 billion fewer highway miles in April of this year, as compared to April of 2007. Now, why is certainly no mystery. I am curious to know, however, what everyone is doing to cut back on so many miles. Carpooling? Walking? Bus riding? The article also says that Americans are buying smaller cars, which makes sense. But what to do when you can't drive a smaller car, like this family of seven in Ohio. 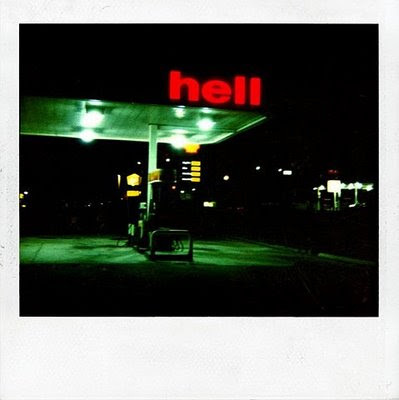 Now, I think we all agree that the halcyon days of $1.50/gallon gasoline are over. And at least we haven't descended into chaos over our new fuel cost reality. But really, I wonder how we will cope with our fuel and driving addiction in this country, vis-a-vis ever mounting gasoline costs. Many Americans are at a disadvantage. Our family is fortunate enough to live a walkable distance to town, with sidewalks all the way. Most Americans, however, do not. Many Americans also have larger families, which makes using transportation other than their own vehicles, impractical at best. Walkable Urbanism is the new buzz word on this topic, and refers to people moving from the suburbs and rural outposts back into the cities, where public transportation is readily available and most necessities are a walkable distance from home. 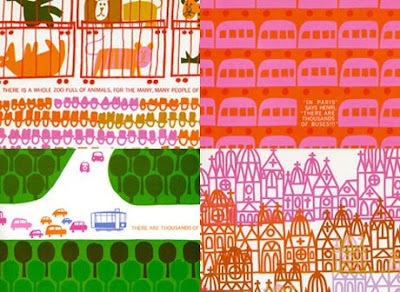 It has also been used to describe the redesign of existing suburban towns to promote walking. 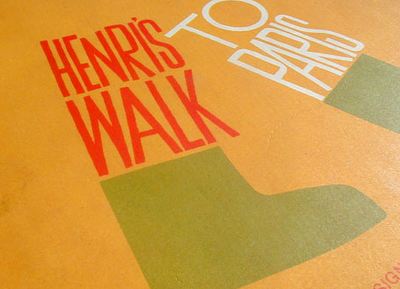 Being an ex-New Yorker, I'm all for walking more. But Walkable Urbanism is an expensive solution. Who pays for all of suburban America to be redesigned? And moving back to the cities? Who pays for that? As Derek Hunter says in the NPR story, moving a family of seven from Lima, OH to New York City hardly seems like an affordable solution to their family's current fuel cost crisis. So, what's the solution? How is your family coping with the rising cost of fuel? And what are your plans for the long term? We are in full birthday party planning mode in my house because the little one is just about to turn two. (How the heck did that happen?) 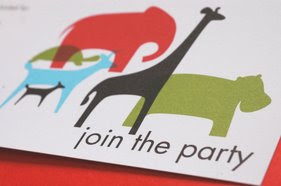 I've been hunting around for some fun and creative ideas for kids parties and found this great list at Cookie. These ideas are truly inspired and have nothing at all to do with TV cartoon characters. The Messy Art Party sounds like big fun and the Around-the-World Party would be quite an adventure. But what about a Pajama Party at the Zoo? That would be truly wild. 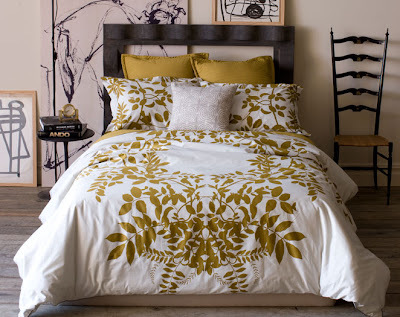 I really, really, really wish that my bedroom looked like this. Find it at Dwell. 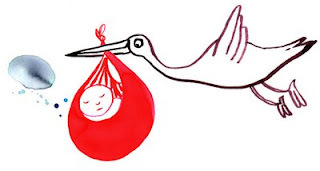 Just about every woman I know right now is pregnant, so I spend a lot of time these days searching shower gifts, newborn gifts and all things very, very small. I found this wonderful guide on Cookie to help all you Mamas-to-Be sort things out. From birth plans to birth announcements, from choosing a name to choosing the right bedding, this guide's got it covered. Have fun! 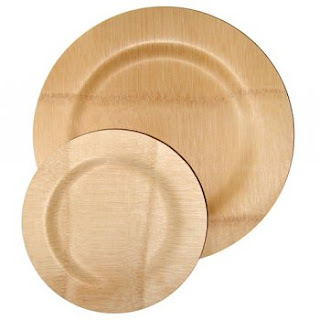 Pretty, stylish, green, these disposable plates by Bambu are the essence of eco-chic. 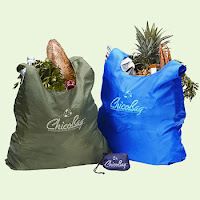 Made from 100% organic bamboo, they are stronger than paper, classier than plastic and totally biodegradable. 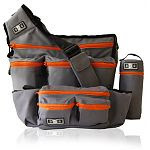 Find them at Branch, a "sustainable design" store a dear Mama-to-Be friend introduced me to. Thanks, Stef! And since you're dressing up your backyard dining, how about spicing up your menu with some seared ahi tuna? Yes, Mamas, it's Friday the 13th. This is actually the only one of all 2008. I've never been plagued with much fear of this date, beyond the anxiety the films provoked at slumber parties. There is actually quite a bit of history of superstitious belief surrounding Fridays and the number 13, but dread of Friday the 13th in particular seems to be a 20th Century phenomenon. So, unless you're paraskavedekatriaphobic, I say get out there and play the lottery today. Like they say, you never know. I had a really nice chat last night with a dear Mama friend, who also happens to be a psychiatrist. She's a fantastic mother of three, who always seems like she has it together and, truth be told, I've always been a little bit in awe of her supreme Mama capabilities. 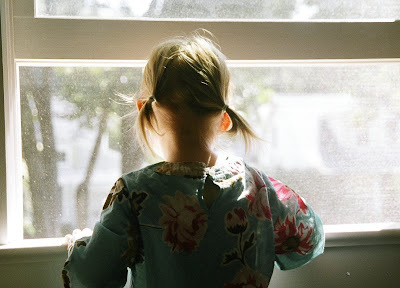 We opened up with each other about how, many nights when we get into bed, we go over in our minds all of the things that we could have done better or differently during the day with our kids. And each night, we vow to be more patient, more loving--just more--the next day with our kids. I was grateful for her honesty, grateful to know that this Mama who I respect and admire also has doubts about herself as a mother. I thought a lot about our conversation, and realized that this must be a common symptom of motherhood. I do not think that striving to do better is a bad thing. On the contrary, this is what drives us to be better people. I do, however, think that we--as women, as mothers--do ourselves and our families a disservice to simply focus on ways that we feel we failed. While I cannot promise that I will stop going over my daily "mistakes," I hereby vow to remind myself of my daily successes. I will remind myself, each night, of at least one thing I did right. Whether it is laughing with my little one, holding her in the night when she can't sleep, telling her that I am proud of her, reading her an extra book, I will acknowledge this to myself as a success. By acknowledging what I do right, I care for myself, something that Mamas in particular do not always have at the top of their mile-long "to do" lists. By caring for myself in this way, I will, I believe, ultimately be a better mother, a better wife, a better friend. Every Monday Matters is a movement, a charitable foundation and a book. 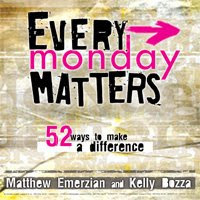 The book "takes 52 Mondays, provides 52 creative but doable activities, and gives 52 down-to-earth ways to make a difference. This 'action' book is a perfect way to have a positive impact, get others involved, and make a difference in your life and lives of those around you." I have blogged previously about meaningful, charitable activities families can do together, and this book sounds like a wonderful resource for families interested in doing good. There's even a list of 52 activities on the website, many of which are family friendly. Think it's a good idea? Spread the word. 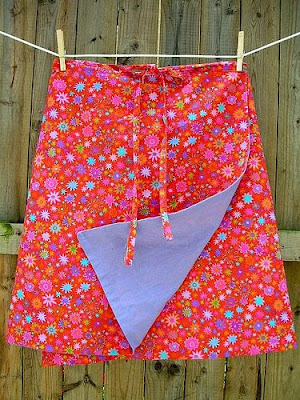 This DIY wrap skirt I found on Spool could not be any cuter. Honestly. I'm not much of a sewer, and have always had much respect for those who are. This skirt is cute enough for me to give the whole thing another try. I promise to let you know how it turns out. 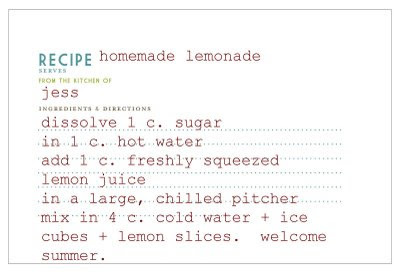 I just found this delicious, summery, homemade lemonade recipe on Living the Swell Life. I can't wait to try it! Alright, I guess I haven't quite gotten this whole rising price of gasoline madness out of my system yet. And with prices in my neck of the woods this weekend hovering around $4.45 a gallon for regular unleaded, how could I? Like many of you, I imagine, there's been talk around this Mama's house of switching out the thirsty beast in the driveway for one of the fancy new hybrids on the market. But does it really make good financial sense? This new article in U.S. News & World Report does the math for the rest of us. You might be surprised at how little money you actually save with some of the models. And because the hybrids generally cost more than their gas-only counterparts, you won't believe how long it will take you to make back by saving at the pump the extra cash you shell out up front for these hybrids. The Chevy Tahoe hybrid, selling for almost $15,000 more than its gas-guzzling twin, will take 16.9 years to pay for itself in gas savings! (Also of note, the Chevy Tahoe hybrid will only get you 21 mpg, which is what I am currently getting on my gas-only family car. So "hybrid" is not always synonymous with "most efficient.") Even the Toyota Highlander hybrid, selling at about $6000 more than its gas-only counterpart, will still take more than 10 years to pay off that debt in gasoline savings. The Honda Civic hybrid will take more than 12 years to pay the difference in price with the money you save at the pump! Now, saving money on gas is not the only reason people are buying hybrids these days. And Mamas I'd never say that polluting less is a bad idea. But for many who are eyeing these cars as a way to fatten the bottom line, the math just doesn't seem to make sense. Looks like walking, running, biking, car-pooling, mass transit riding and scootering are still our best bets to save money and live a little bit greener. I found this gem on Lovely Little Things. I have no idea if the photo is doctored or if the "s" really burned out, but I don't think it matters. It's just funny. On that note, Mamas, Happy Friday! Have a wonderful weekend! Here's a good--if frightening--report on the current state of our economy, though not from Wall Street gurus or analysts. NPR's All Things Considered interviewed three women, from three different financial brackets, about how their supermarket experiences have changed recently. I'll be the first to admit that I have altered my habits when it comes to feeding my family. In fact, one of these women's stories is a mirror of my own recent experiences. These are uncertain times, and economic uncertainty is a new experience for many Americans. I've blogged here before about money saving ideas for families, with ideas on how to have fun while still being frugal. And these ideas still apply. But the reality for many right now is scary, and in the midst of it, it can be difficult to see when, how and if it will all end. One of the things that I take away from a report like this--and from my own anecdotal evidence--is perhaps more uplifting. Listening to these women, I hear strength and resourcefulness. The first woman, in particular, exhibits a gritty determination to navigate her family through the crisis, whatever it takes. This flexibility, as described in another NPR report by Brighton Earley, is how we will make it through the current economic crisis, and so many other crises that we face in our lives. It is, perhaps, one of our saving graces. We adjust, we make due, we survive. And we come out the other side stronger for it. That's it for now, as we're off to the supermarket. Another book for my Wish I Had Time To Read This list. 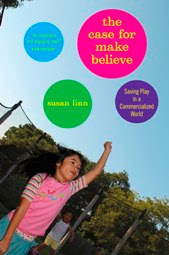 It's called The Case for Make Believe: Saving Play in a Commercialized World, by Dr. Susan Linn. Dr. Linn argues that "while play is crucial to human development and children are born with an innate capacity for make believe, the convergence of ubiquitous technology and unfettered commercialism actually prevents them from playing. In modern day America, nurturing creative play is not only countercultural—it threatens corporate profits." I believe wholeheartedly in this argument. I am notoriously anti-beeping, blinking, whirring, buzzing, singing, talking, toy. These toys seem to play with themselves! Toy buses "recommended" by "respected" parent groups groan and sputter, open their own doors and drive away, all with the touch of literally one button. What on earth is a child supposed to do with that other than watch? I am convinced that these toys are not only annoying, but that they can do damage to a child's cognitive abilities by depriving children of their natural instinct to play in a focused and creative way. The more we deprive our children of true imaginative play, the more they will struggle with many things. The widely admired educational psychologist Bruno Bettelheim, explored these ideas at length, in The Importance of Play. He stresses the cognitive, social and emotional learning children accomplish through seemingly simple, imaginative play. None of this can be accomplished with a noisy pile of plastic, whirring junk in the way. So I say, get the junk out of the way and let the kids play. Today marks the 19th anniversary of the Tiananmen Square massacre, a student protest during which certainly hundreds and possibly thousands were killed in an attempt to exercise free speech against the Chinese Communist rulers. Much has changed in China and much has stayed the same. A palpable anticipation of the Olympic Games rules in Beijing, and a surge of nationalist pride after the Sichuan earthquake killed tens of thousands have obscured, for many, the reality of China's oppression. But today stands as a real and immovable marker of China's brutal truth. Between 50 and 200 people remain imprisoned to this day for their involvement in the Tiananmen uprising. Tibet is still a closed, stifled and violently oppressed place. And Chinese journalists are still officially forbidden from even mentioning the Tiananmen uprising at all, under threat of severe penalty. Indeed, when people within China try to access information online on Tiananmen Square, they will only find government propaganda sites or tourist information. And despite recent overtures, Beijing is still actively supporting genocide in Darfur through policy and continued arms dealing to Sudan. All this is all really just the tip of the iceberg. So, whether or not we choose to watch the athletes this summer who have worked so hard to be where they are, it will be difficult--for me at least--to escape the spectre of the Chinese government's violent and oppressive nature. And today is a grim reminder of this terrible reality. Why does it matter? Because China will be a bigger and far more influential force in our children's lives than it ever was in ours. I adore this lovely and whimsical illustration by Flora Douville. I discovered her blog and it has immediately become one of my favorite aesthetic online destinations. Some of us grew up struggling. Some of us are experiencing financial hardship now, for the first time. Today, All Things Considered on NPR aired an essay by a senior at Immaculate Heart High School in L.A., for the This I Believe series. This young woman's voice and the thought of her mother's struggle, kept me in my car though I was already in my driveway. Listening to her brought tears to my eyes. It is poignant, pertinent and very moving. Listen to it, or read it, here. 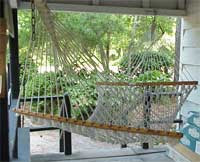 Find this at the Original Hammock Shop. There's no way he won't love it. This Leatherman tool is a dream for those of you with a handyman at home. 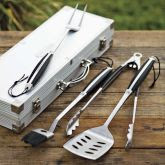 This monogrammed grill tool kit is perfect for the Gourmet Dad. Find it at Williams Sonoma.